Prices start from £30 onward dependent on areas. How does laser hair removal work?Our Nd:YAG laser is a medical grade machine and one of the safest and most successful type used for removal of hair on all skin types. It works by the laser beam having a focal point on the root of the hair follicle, it does this by the beams attraction to the melanin (pigment) in the hair. And uses this is get into the core of the follicle and in return damage it. A process called photothermolysis. The hair needs to be in a specific growth phase in order for this to be achieved. Hence a course of treatments is always needed to ensure all the follicles have been caught in its active phase. Nd Yag Laser hair removal has been clinically proven to be the most effective method of removing unwanted hair. After completion of your personally tailored course of sessions, statistics show that 95% or hair does NOT grow back. And most importantly it is suited for all skin and hair types. 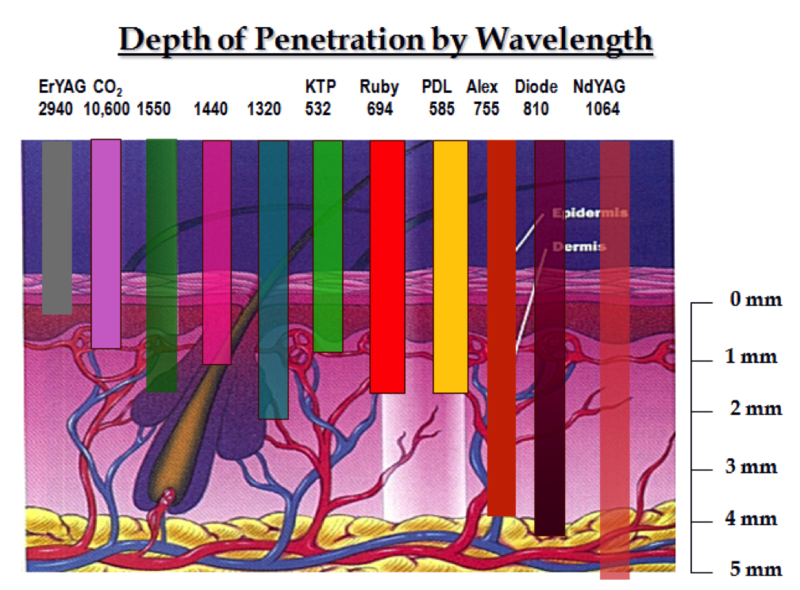 The image below demonstrates the wave lengths and a comparison of treatment frequencies below the skins surface. 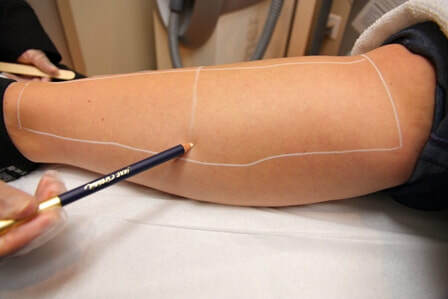 Is laser hair removal safe?You may hear horror stories of peoples experiences with “laser” or hair removal in general. There are many different machines out there, some which claim to be a laser, but are not true forms of concentrated focal laser points. And hence here at LE CRISADORE with our highly trained staff and our Advanced Medical Grade Laser Machine we assure to carry out the treatment with full safety and minimal risks to avoid these problems. Lets be honest any sort of hair removal from the root will be painful. Therefore mild discomfort is to be felt during the treatment and it all depends on your pain threshold. However our trained operators will minimize the effects of the pain by ensuring we are using our cooling aid to help minimize this discomfort. This is why it is important to have your patch test with us to measure your pain threshold and give you a test on what the sensation is like and what to expect. What would help the process? To minimize the pain and ensure the laser works its best it’s vital that you don’t wear any makeup, perfume, lotions or oils on the day of your treatment. We monitor the pain throughout the treatment and some people may feel comfortable taking a paracetamol or pain killer 30mins prior to treatment. Although you probably won’t need to! So the treatment time varied from 10 to 60 minutes or more, depending on the surface area being treated. If you are having full body hair removal lets say this will take around 3 hours and underarms may take 10mins. But your therapist will discuss all of these timings with you when your have your free consultation and patch test carried out. What to expect from a typical treatment?Pre-laser requirements- You MUST have clean skin. Free from any chemicals, oils, lotions, and even perfume! You will also be required to shave the area which you want to have treated beforehand. This is to ensure the laser beam can get to the follicles root supply without hair strands blocking the way. You will then go through your records with your technician, any past history, medications, or any updates will be noted on your confidential history folder and consent will be gained to continue. You can take this opportunity to ask us any questions or queries you have. Please don’t be shy and tell us if any medications or anything has changed at any point during your course of sessions with us. As any new information may be vital to how we perform the treatment such as any chance of pregnancy or being prescribed certain blood thinners. During Laser Session- The parts of your body will be sectioned off. This allows the technician to work each individual area accurately. The Long Pulsed Nd:Yag laser uses a cooling tube to help reduce any discomfort as the second probe would be the laser itself. Typically people say this sensation feel like the pinch of an elastic band or a needle scratch with a mild heat sensation. There may be an odd smell of burning hair in the room as the laser works. Post Laser Session – You must not to use any Sauna, Steam, hot baths or excessive gym sessions as this would cause your body to perspire and may irritate the skin. We advise to avoid any swimming sessions also due to the content of chlorine in the water. You must not apply any lotions or oils, or emollient creams during this 24hours breathe period. After this resting day and once your skin feels like it’s not sensitive and back to its usual texture and comfort, you must apply a high SPF sun lotion to the area/s treated. Apart from that there is no specific downtime and you can bounce back to doing your usual daily routine. Prior to any treatment we will discuss with you your requirements and expectations. We will also analyze your hair, skin type and also carry out a patch test. We will also take confidential notes and record of any medical history or past laser experiences as well as note your journey with us. Your laser hair removal journey will be discussed according to your needs and may vary from person to person and area to area, Hence this is tailor made to YOU! Generally, 6-12 treatments on an area is recommended, with a treatment taking placing every 4 to 6 weeks. How long does the hair removal last for? No hair removal method is completely permanent in a sense. We eliminate the hair growth completely but at some point, some people’s hair “may” come back. This will not be in to the extent that it originally was but varies on a person due to stages of their lifestyle, hormone or health reasons can cause for hair to grow back a little. Which is why you are advised for a top –up session (every year or if you have a growth spurt) as will be discussed in your treatment plan if you should ever need it. You may not even need this session throughout your life as it varies per person. What Skin Type would I be? As a rough guide the Fitzpatrick scale is used to assess skin types but this will be discussed further in your consultation with us. TYPE I: Very pale and prone to burning, never tans. TYPE II: Pale, very sensitive to sun and often burns, hard to tan. TYPE III: Olive, sensitive to sun and sometimes burns, tans slowly to light brown color. TYPE IV: Light brown, not particularly sensitive to sun but rarely burns, tans to moderate brown. TYPE V: Brown, not sensitive to sun and rarely burns, tans well. TYPE VI: Dark to intense brown, insensitive to sun and never burns, deeply pigmented. I have very dark skin and dark hair will can I get this laser treatment? Yes! This laser works wonders on all skin types, shades and colors. The variable is the hair color. As long as your hair is dark in nature this laser is safe for this treatment. I have blonde fair hair can I get this treatment? Unfortunately NO LASER hair removal system will work on your hair type. Lasers do NOT work on blonde, grey, white or red hairs. What does a full body laser session include?A full body treatment means every area which you would require hair to be removed, common areas being the Full Legs, Intimate Area, Full Arms, Underarms, Abdomen, unwanted facial hair. This again will vary on your individual needs and will be discussed to make your treatment plan at your free consultation. You will notice a difference after your first session. The hairs in the phase of removal should drastically be reduced but once your agreed sessions are completed you should feel like a new person completely. Will I need any aftercare or are there any side effects? You may find that you are quite sensitive in the area but no particular down time is needed. Suncreen with high SPF rating MUST be applied daily. But further person specific after care will be given to you at your Free consultation and patch test. If you follow your technician’s professional advice you should not have any side effects. But we are always here to help and just a phone call away. I have had laser hair removal in the past can I still get this done? Most likely yes! But this will depend on when you had your last session, the area they worked on and also any information of the machine they used may help. There is the odd chance that you may be in the minute percentage of people on which whom laser simply does not respond to their skin or hair type. We do not guarantee the complete permanent removal of hair as mentioned earlier this can change throughout life, and not work for everybody regardless. Which is why we advise the patch test (to see the results yourself) and a full consultation with our highly trained technicians to ensure the best outcome for you and your concerns. Beauty Blogger Kaushal Beauty has a great video on her laser hair removal journey which uses the exact same Nd:Yag machine which gave her the amazing hair free results. In-fact we have received our one to one training from Tracey, the same person who carries out Kaushal's treatments. She has over 20 years of laser and beauty experience and is an ITEC, CIBTAC, BABTAC & INDUSTRY TRAINER. One of UK's most recognized and respected laser therapists. She is responsible for the training of Doctors, Nurses and Technicians in Private and NHS hospitals and clinics in the use of medical grade lasers.